Motivated to govern in virtue, an example is the north star. It rests and all the stars coalesce around it. Gong is pronounced as gong, and can also be supplanted as the character gong (implying an offering made to a superior or ancestors). The character Zheng (meaning to govern) is actually referring to being upright (upright in governing). So people taking action to make others be upright is not upright. Virtue is speaking of the achievement of something, it is grasped by the heart and not lost. The north star is the polar north, the centre of the sky, it always rests there and does not move. Together refers to direction and is speaking of the stars of the four corners rotating around and returning all along. The govern with the will of virtue means one will practice non action and the world will return itself. Its image is like this. Cheng zi said: to act in governance with virtue , one can then be without action. 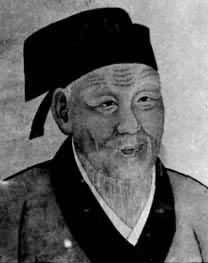 Cui shi said: to govern in virtue means to not move and thus transform. Do not speak, but be honest, and non action will be born.